For the Purim Guide Texbook/Workbook - Click Here. The First Customizable Art Megilah! With an original, Family - Friendly Translation! Many beautiful Megilot illuminated the centuries. There has never been one like this. That's because our Art Megilah will feature your students' artwork, illustrations and/or staged photos. 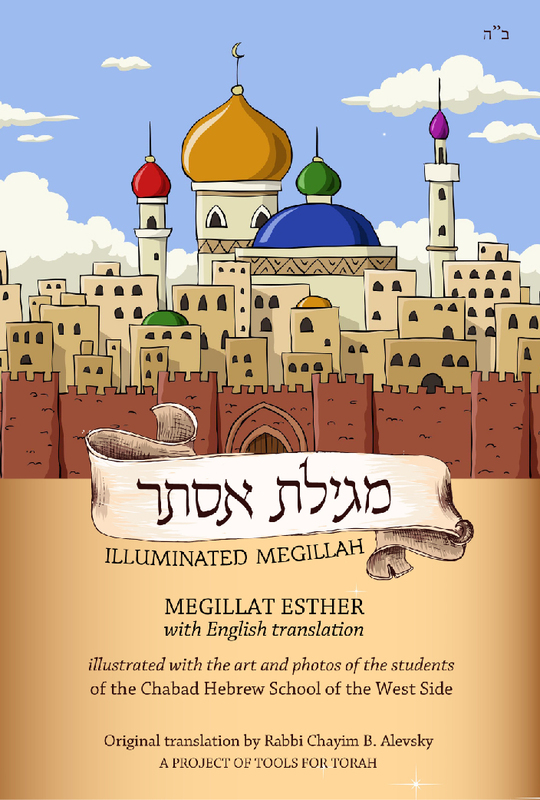 We will provide you with beautifully designed, new, Family-Friendly translated, Hebrew/English Megilah in PDF or Print, containing 30 pages [opposite the Megilah text] of YOUR students' photos and illustrations. Your Megilah front and back covers will feature your school or organization information along with your or your sponsors' logos. Below are some screenshots samples of how you can customize your Megilah. More "actual" samples (from other printed Megilot) and instructions will be sent to you after your order. Scroll Down or Click here for more details and pricing. Original, clear, easy to understand translation. Sample potential pages with borrowed pics and art from Rabbi Google. 1. Photos and / or illustrations. Take pictures of your students acting out the Purim story or scan their Purim illustrations onto your computer. [IPO] #1: You insert the photos. We send you a simple Microsoft Word file, with clear instructions for you to insert the photos and type in the titles and illustrators names etc. [IPO] #2: We insert the photos. Save the file and send it to your local printer or book printing site to print. We print the books in softcover, full color, and they arrive at your doorstep within 2 weeks from when we receive your photos and info. Our printed books are SOFTCOVER, FULL COLOR and perfect bound. $100 - one time fee for the Megilah PDF with your school / Shul / Organization's name on the front cover and sponsor's name and logos etc. on the back cover. $50 for us to insert your photos and caption text into your Megilah file. $10 per book we print. Minimum order 10 books (=$100). $10 S/H cost for 10 books plus .50 each additional book. If you send us your photos and illustrations to insert and return for you to print on your own, we will iy"H send them back within 1-3 days. If you want us to print the books, they will iy"H be delivered to you within 2 weeks after you send us ALL your prepared photos and text. You can decide (and pay) later if you'd like to print on your own or with us.